The baggage delivery service in Japan is a great idea if you’re bringing your own ski gear, especially if you are spending a few days in Tokyo before you arrive in Hakuba. Baggage delivery from Narita Airport to Hakuba usually takes around 24 hours and is very reasonably priced (the last time I did it, it was under 2000 Yen for a snowboard bag full of kit, but depends on weight). 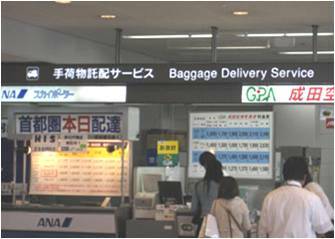 There are a number of operators at the Narita Airport terminal. As you come out of the arrivals area, turn right and you will see the signs. The White Horse Hotels can also arrange for your gear to be delivered back to Narita Airport, for you to pick up at the check-in area before your departure. Please ask us for more information during your stay.